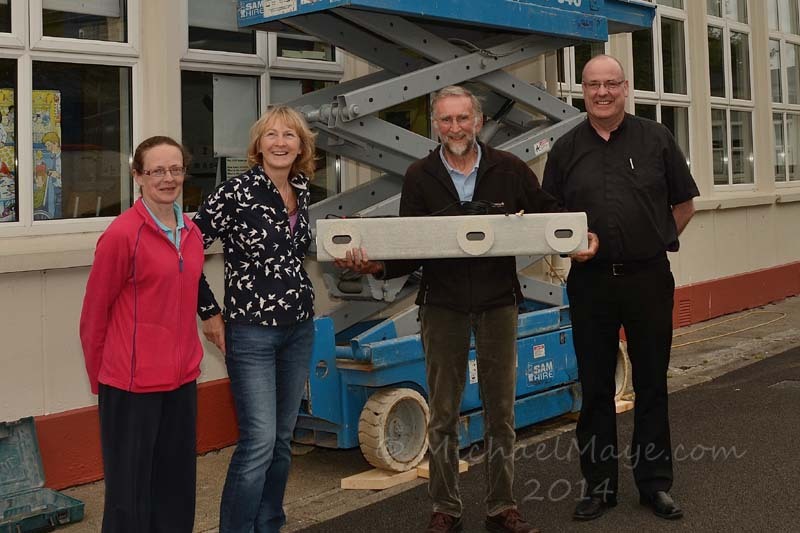 On Friday June 20th , Lynda, Chris, James, Michael Maye PRO for Swinford Tidy Towns, Fr Dermot, Chairman of Swinford National School Board of Management and myself, Marian Thornburgh, Green School Coordinator, watched as the nest boxes were erected. Chris showed us the inside of the nest boxes. They are tiny. Also we were amazed at the tiny size of the cameras in two of the nest boxes. Chris set up an amplifier with the sounds of swifts which is being played constantly at the moment (at time of writing). It was amazing – no sooner had Chris and James the boxes and sounds in place than the swifts began to hover close to our nest boxes. We are hoping that some of them will choose our nest boxes for their nests for next summer. Watch this space!!!!!!!!! (When the Swifts come back again to lay their eggs, we will have the cameras streaming live here on the website). At the last count in Swinford 2015, (excluding the Save Our Swifts Project) there were 14 nesting sites with 14 pairs flying. There are numerous other Save our Swifts projects all around Mayo. For more information visit https://www.swiftconservation.ie/. All the latest news and updates from our Swifts here in Swinford. On Thursday the 5th of May 2016, the first of our Swifts arrived back in Swinford after their long journey. Here's some video I managed to get of them over the tower of the old Town Hall. I hope to get a lot more video of the Swifts during their stay here in Swinford.